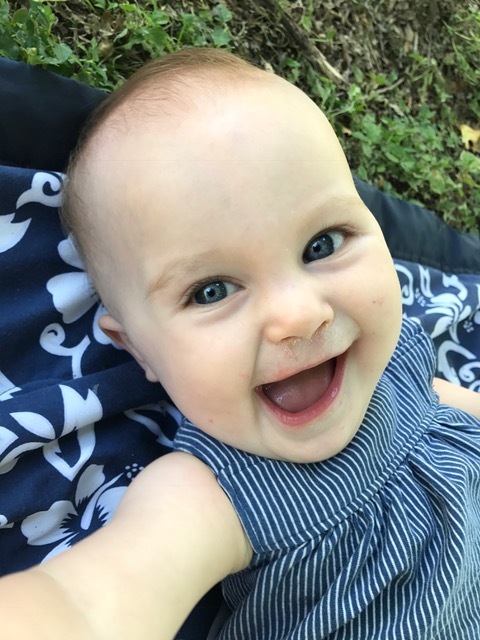 Sweet Eloise Jane, yesterday you turned 10 months old! You are an extremely clever, curious, and determined little one who has already figured out how to open cabinets and garbage cans (either via your walker or by balancing yourself with your weight on one hand while you create mischief with the other). You are so incredibly affectionate, and give the best nuzzles and cuddles. You are also incredibly LOUD and still absolutely let it be known when you DO NOT LIKE SOMETHING. Your curiosity + determination + loud voice definitely lead to protests when you are not allowed to do something you want to do. Here are your official 10 month updates! How old? 10 months old! How big? We won't have official stats until your 1 year appointment, but you are most comfortably fitting into 12-18 month clothing and still appear huge for your age! We had a very rare cooler day in the 70's yesterday, so I broke out these adorable corduroy overalls that have been gathering dust in your closet. I fear by fall you'll have already outgrown them! Your upper middle teeth came in this past month- for a grand total of 4 teeth! Interesting fact: each of your 4 teeth thus far have been spaced out exactly 10 days apart from one another. Curious if that cadence will continue? You appear to more purposefully be saying "Mama, Papa, ba-ba (bye-bye), up, and ah dah (all done)." You have also started doing an "ooooooooo" sound this month which is accompanied by the CUTEST little "pickle" face. You still love and will eat any and everything. To include leaves, magazines, straws, paper, food packages, etc. ; ) You nurse 5-6x/day and then get a pumped bottle of milk before bed. Still great! Even through teething, which is a small miracle. Bedtime is at 7, and you sleep until between 6:30-7am each morning. Your naps have lengthened and thus moved later in the day- usually the first is from 9-10:30 or 11am, and the second one starts around 1:30-1:45 (for another 1-2 hours). You've taken to falling asleep with your little booty in the air. So cute! Nada. You show zero interest in crawling, though while sitting you will lean forward on your hands a bit. In the past month, however, you have stood ALL BY YOURSELF a few times for a few seconds at a time! You also love to hold onto random objects with one hand and reach for things with the other, all while shifting your weight and balancing on your feet (most notably after using your potty you like to stand and hold onto the toilet with one hand while reaching for the flusher, toilet paper, or cabinets with the other). You even flushed the toilet once! You also love to practice walking while someone holds your hands. Whenever you stand or walk you breathe heavily out of your mouth in concentration- puffing and blowing and weezing. It's pretty hilarious! You go almost every time you sit on your potty (which is when you wake up, after each of your two naps, and again before bed). We've only had two #2's in your diaper this past month, and those were both on days when you were with your nanny (so you had a bit of a different routine). Sunglasses: You love playing with sunglasses and are actually quite amazingly adept at putting them on yourself. You definitely have a knack for figuring out mechanical things- you are such a little scientist, and so meticulous and determined in your explorations. Water: Like your sister, you love playing in any type of water: baths, buckets, pools, etc. You take weekly swim lessons and while you don't love going under water, you do love kicking your way around the pool! Music: You love our weekly music class and will clap your hands while the music plays. We've also found that if you are fussing in the car putting on the Moana movie soundtrack quiets you right down! Teddy bears: We have a lift the flap book, and every time we get to the page with a teddy bear you shriek in delight and often lean in to give it a kiss. Iyla has a couple of stuffed teddy bears that you are equally delighted with. Your walker: You love cruising the house and are prone to get into mischief, opening Iyla's play kitchen cabinets, pulling down your high chair, grabbing my purse and dragging it with you, taking Iyla's play broom and parading through the house with it.... I am actually quite grateful you are NOT mobile yet, because I have a feeling once you are it's going to be ALL HANDS ON DECK. "Nothing to see here, Mama....."
Mirrors: You love to interact with your reflection and make silly faces! Being outside: Always a happy place for you. Here are a few more photos from your past month! We love you so much sweet Eloise Jane! Happy 10 months to you.